This week Trolley Tours in Key West celebrated the 30th Anniversary of the Conch Republic. On April 23, 1982, the citizenry of Key West became fed up with the border patrols set up between Key West and and mainland of Florida so they seceded and created the Conch Republic, a sovereign nation with a prime minister, ambassadors, the whole nine yards. Fast forward 30 years later and the same cast of characters were on hand to celebrate as only we can in Key West. No Key West Vacation celebration is complete without a Key Lime Pie and this one was a doozy. All seven feet of creamy key lime filling and meringue that had to be cooked with a blow torch. We thought we would share our favorite recipe for Key Lime Pie which comes from the Curry Family, who have been on the island for 8 generations. This makes one 9″ pie. 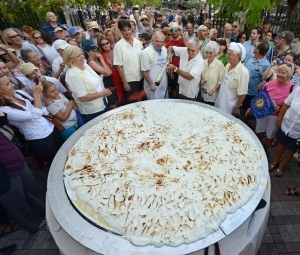 If you want to create your own seven foot key lime pie multiply the ingredients by 120! Mix ingredients to a smooth consistency. Pour into a graham cracker pie crust. Meringue topping- Whip the egg whites while adding 3-4 spoonfuls of fine sugar. While the meringue is fluffing sprinkle in 1-2 teaspoons of vanilla extract. When the meringue is stiff, use a spatula to spread on top of the Key Lime Pie. Place the pie in the oven and bake at 350 degrees Fahrenheit for no more than fifteen minutes. When finished allow the pie to cool or fifteen minutes before refrigerating. If we had not seen it with our own eyes, we would not have believed it. 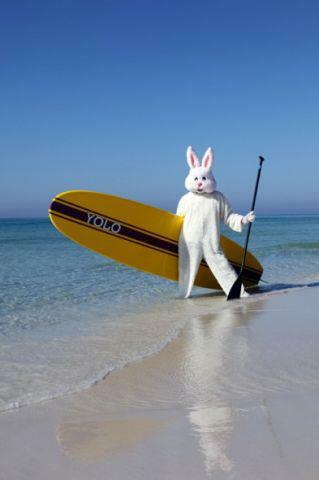 The Easter Bunny, getting some R & R before the big egg drop on Sunday, was seen in Key West getting in a little paddle boarding. Who knew? Posted in | Comments Off on Only in Key West…. 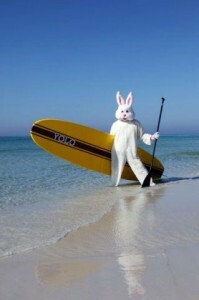 You are currently browsing the Old Town Trolley Tours Blog blog archives for April, 2012.